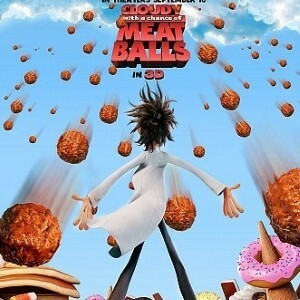 Child-friendly?This animated 3D feature is based on the children’s book Cloudy with a Chance of Meatballs and brings the classic tale to life. The film caters to a younger audience, given the source material. However, the 3D effects that come with the film may be scary at certain points of the movie for some children. Also, there is some mild language throughout the film and a budding romance between two main characters. Important note: the movie’s plot is different from the book’s, which may disappoint some. This makes the film appropriate for children ages 6 and up. There are some life lessons subtly hidden in the new film Cloudy with a Chance of Meatballs, but most children will be more interested in the 3D effects of the movie. The film is based on the 1978 children’s book of the same name, though parents who have read it to their children should be warned: the feature strays from the original plot. Instead, the movie reveals inventor Flint Lockwood in his younger days and how the town of Swallow Falls is affected when food literally starts falling from the sky. Soon, the issue of overindulgence emerges and the film eventually asks the question of whether or not having too much is a good thing. There is also another lesson that focuses on how important a father‘s encouragement can be for a child, which may be a teaching moment for some parents. Though it is animated, the 3D effects may be off-putting for some younger audiences. There are also instances of mild language and some innocent sexual tension between two characters.